Write an application for a cnstruction company to handle a customer’s order to build a new home. 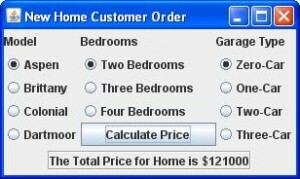 Use separate ButtonGroups to allow the customer to select one of four models, the number of bedrooms, and a garage type. Assume that the models are the Aspen, $100,000; the Brittany, $120,000; the Colonial, $180,000; or the Dartmoor, $250,000. Assume that any model can have two, three, or four bedrooms and that each bedroom adds $10,500 to the base price. Assume that the garage type can be zero-, one-, two-, or three-car, and that each car adds $7,725 to the price. Save the file asJMyNewHome.java.